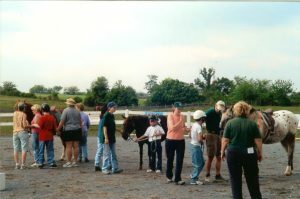 The Frederick County 4H Therapeutic Riding Program began in April 1984 as a special project under the Frederick County 4H Horse and Pony Club. The program is incorporated in the State of Maryland as a non-profit organization. We provide a seven week session of riding instruction each spring and fall at nominal fee to students. The program always has a waiting list of applicants, but our enrollment is limited by money, the availability of volunteers and the time available to hold classes when students can attend. Debbie has owned and operated Silverado Stables as a boarding facility since 1981. Being a past 4H Horse and Pony Club Leader, Silverado has become a boarding facility for families. Debbie began volunteering for therapeutic riding in 1983, working in the ring as a side walker and/or leader. In 1988 she became certified in Basic Therapeutic Riding Instruction and began teaching. In 1986 Debbie studied under Para-Olympian Robin Brueckmann and Sandra Cabell, a Senior Centered Riding Instructor. 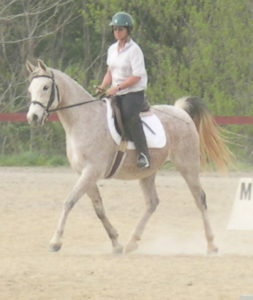 Debbie has attended many Centered Riding Up Date clinics with Sally Swift, Wendy Murdoch and Lucille Bump. She is currently the President of the Frederick County 4H Therapeutic Riding Program. 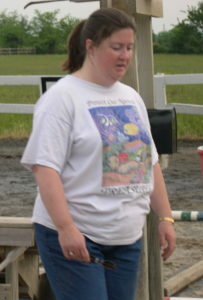 Kim began volunteering with Therapeutic riding in the Spring 2006. She and her husband, David, have two grown children. After realizing her empty nest was too empty, she decided to become a volunteer with the Program. Kim enjoys sharing her lifeline passion for everything equine with the TRP riders and other volunteers. When the opportunity to train as an instructor came along, she was happy to join the class. Kim also enjoys her own riding lessons from Debbie and has fun sharing things she learns with the Therapeutic Riding students. Georgina has volunteered as a leader and side walker for Therapeutic Riding since the Spring 2006. In the summer of 2008, she completed and Instructor’s Course with Debbie and is excited to join the Program as an instructor! Georgina works as a school counselor at Twin Ridge Elementary School in Frederick County. In her free time, she enjoys riding at Silverado Stables, running and writing. Amanda has been involved with our Program since 1993. She began as a barn volunteer but later assisted in the ring as well, before taking on a position as barn manager on Saturdays. 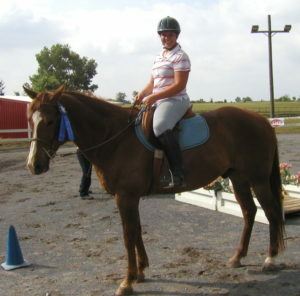 Amanda left the barn behind and began instructing in 2007, recently completing an Instructor’s Course with Debbie. She currently works as a Recreation Therapist at Springfield Hospital Center. Amanda enjoys spending time at Silverado both with her horse Colonel and with the Program.Georgina has volunteered as a leader and side walker for Therapeutic Riding since the Spring 2006. In the summer of 2008, she completed and Instructor’s Course with Debbie and is excited to join the Program as an instructor! Georgina works as a school counselor at Twin Ridge Elementary School in Frederick County. In her free time, she enjoys riding at Silverado Stables, running and writing. Miss Lori, as many of our students call her, began volunteering with TRP in 2004 after her sister, Rhonda, our Past Volunteer coordinator asked her to come out and volunteer “we needed her help”. Lori enjoys watching all of the students achieve their goals and is especially happy that she is helping make those achievements happen. Lori’s other job is a bookkeeper for The Furniture Market in Waynesboro, Pennsylvania. Lori has five Arabian horses that she enjoys showing on the Amateur Arabian show circuit. 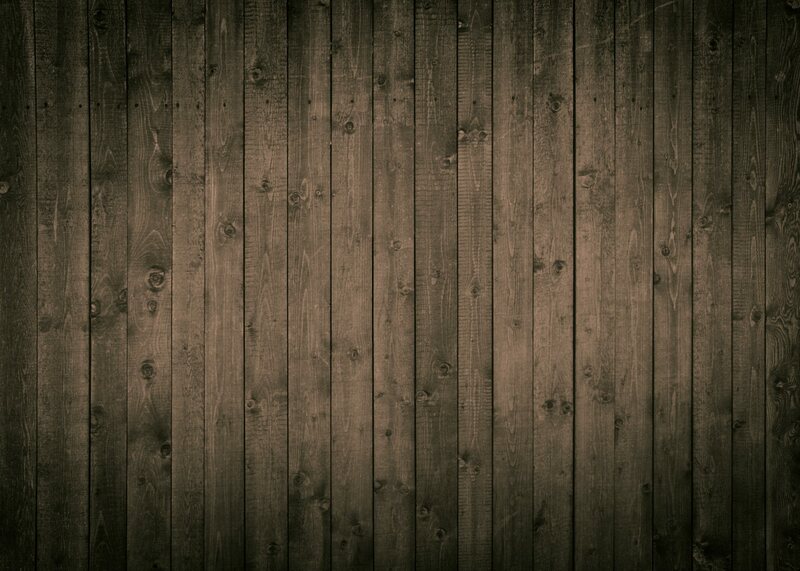 Without our wonderful volunteers our Program could not exist. Join us as a volunteer today or by donating to help make a difference in the lives of others!